Should we be polite to our digital assistants? It’s a question that has become more and more important to answer as artificial intelligence continues to become a large part of our daily lives. This episode features special contributions from some of our listeners! I want to hear your opinion: Is it a good thing for us as individuals and as a society to say "please" and "thank you" to Alexa, Siri, and Google Assistant?Is it fine for us to verbally abuse them because they are just robots? How do you separate very average technical writers from the best ones? Be part of the next Y. Karp? Why Not! podcast episode!Are you polite to Google Assistant, Siri, or Amazon Alexa? Do you yell at them when they don’t give you the results you want? 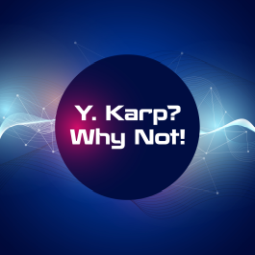 Leave me a voice message and let me know - you could be on the next episode of the Y. Karp? Why Not! podcast! Send me a WhatsApp voice message to +1 346 843 0044 and tell me your first name and then whether you think our kids should grow up saying “please” and “thank you” to these devices? How do you think relating to digital assistants as if they are real people affect our society, if at all? This week’s episode is proudly brought to you by ZekTec custom software. If off-the-shelf software packages just don’t cut it, ZekTec has you covered. Visit www.zektec.com. Now that Bitcoin has reached astronomical value (over $19,000 per coin as of today) the entire idea of cryptocurrencies - decentralized digital currencies - is once again a hot topic. Here's a bit about the most famous of all cryptocurrencies, Bitcoin. I have something a bit different for you this week - I challenged myself to write a story in only one hour and then to narrate it on this podcast. Well, I did, and here it is - enjoy! Which jobs will still be around in 50 to 100 years? It’s really hard to know. Almost every profession out there has a technological doppelganger. Writers, coders, technicians, drivers, construction workers, you name it. But what's the one profession that will absolutely never disappear? This episode is proudly brought to you by our sponsor ZekTec custom software. If off-the-shelf software just doesn't cut it, ZekTec has you covered. Visit www.zektec.com.